2016 has been considered as the base year for company profiles. In cases, wherein information for the base year has been unavailable, the years prior to it have been considered. Various secondary sources, such as Factiva, Hoovers, and Manta have been used to gain insights into the biomedical textiles market. 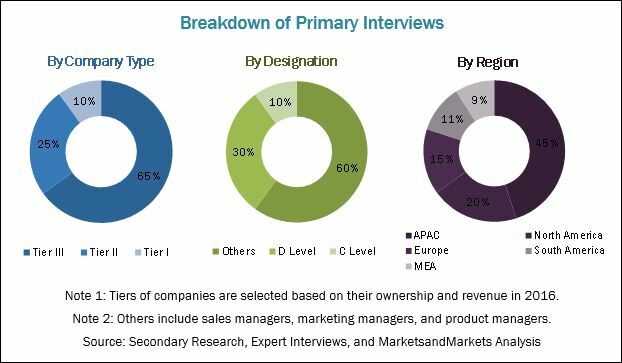 Experts from leading companies manufacturing biomedical textiles have been interviewed to verify and collect critical information and to assess the trends in the biomedical textiles market during the forecast period. Top-down, bottom-up, and data triangulation approaches have been implemented to calculate exact values of the overall parent and each individual market sizes. The market for biomedical textiles has a diversified and established ecosystem comprising upstream players, such as raw material suppliers, and downstream stakeholders, such as manufacturers, vendors, and end-users of biomedical textiles as well as various government organizations. Leading players operating in the biomedical textiles market include Royal DSM (Netherlands), Covidien (Ireland), Integra Life Sciences (US), Johnson & Johnson (US), Smith & Nephew (UK), Medline Industries (US), B. Braun Melsungen (Germany), and Cardinal Health (US). This research report categorizes the biomedical textiles market based on material type, property type, end user, and region. It forecasts the revenue growth and analyzes trends in each of these submarkets. 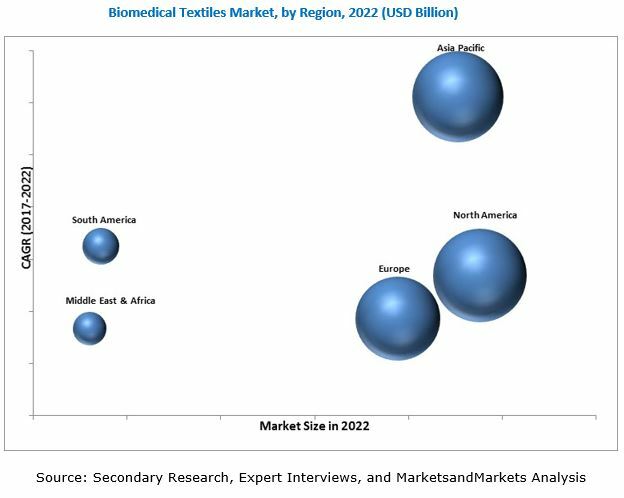 The biomedical textiles market is projected to reach USD 14.50 Billion by 2022 from 10.99 Billion in 2017, at a CAGR of 5.7% between 2017 and 2022. The growth of this market can be attributed to the increasing use of biomedical textiles in non-implantable, implants, extracorporeal, and surgical suture applications. The biomedical textiles market has been segmented on the basis of fabric type, fiber type, application, and region. Based on fabric type, the biomedical textiles market has been classified into non-woven, woven, and others. The non-woven segment of the biomedical textiles market is projected to grow at the highest CAGR during the forecast period. This growth can be attributed to increasing demand for non-woven fabrics from non-implantable applications, such as gauze, cohesive, adhesive, tubular, and triangular bandages. Based on fiber type, the biomedical textiles market has been classified into biodegradable and non-biodegradable. The non-biodegradable fiber segment dominated the biomedical textiles market in 2017 due to the growing demand for non-biodegradable fibers, such as polypropylene, polyethylene, polyamide, and polyester in non-implantable applications. Non-biodegradable fibers are also widely used in many surgical sutures, implants, and extracorporeal devices. Based on application, the biomedical textiles market has been segmented into non-implantable, surgical sutures, implants, and extracorporeal. The non-implantable application segment is expected to register the highest CAGR between 2017 and 2022. Rise in the number of surgeries and accidents globally is expected to drive the demand for biomedical textiles, including wound care products such as bandages, in the non-implantable application. North America is estimated to be the largest market for biomedical textiles in 2017. The growth of the biomedical textiles market in North America can be attributed to the large spending on healthcare and technological innovation in healthcare products. However, the market in Asia Pacific is projected to grow at the highest CAGR between 2017 and 2022 owing to the large aging population and rise in the number of surgeries. Increasing expenditure on healthcare facilities and rising income are also propelling the growth of the biomedical textiles market in APAC. High R&D investments and capital requirement for making biomedical textiles act as key restraints to the growth of the biomedical textiles market. Royal DSM (Netherlands), Covidien (Ireland), Integra Life Sciences (US), Johnson & Johnson (US), Smith & Nephew (UK), Medline Industries (US), B. Braun Melsungen (Germany), and Cardinal Health (US) are the key players operating in the biomedical textiles market. These players offer a wide range of biomedical textiles to strengthen their competitive position and cater to the growing demand for biomedical textiles. Royal DSM is one of the major players in the biomedical textiles market. The company has established a strong foothold in the biomedical textiles market by engaging itself in the various business strategies. These business strategies include partnerships and new product developments. The company manages its biomedical textiles business by providing implantable products to the medical industry.